in music. We get inspiration from indie as well as from goth"
Read an interview with PH Petersson written by Kristoffer Elofsson (Propaganda no. 3), back in 1994. The mediators of thoughts in Kiethevez from Gothenburg have just released their "Three Empty Words" album on October. It´s their first album after their successful "Replenish My Mind" single. The synthiepop band have also made a video to be shown on Z-TV and MTV. Kristoffer Elofsson from Propaganda called them up to find out some more. Right now Kiethevez are on a "October Tour" together with Children Within and Sombre View. But it all started back in 1990. Four young men from Gothenburg were tired of all the synthiepop bands that named themselves after something related to electronics. Therefore they chose an odd name for their band, that´s also hard to pronounce. The four members of the band all contribute material. - Our album is very varied due to our different tastes in music, Per-Henrik tells us. We get inspiration from indie as well as from goth. If something sounds good we try to make something of our own out of it. We don´t want our songs to sound alike and I think we´ve managed to do so. The best thing about "Three Empty Words" is the variation, he adds.The lyrics reflect their lives. - We put a lot of effort into them. The inspiration might come from something we´ve seen or heard. The lyrics are often melancholic and sad, but that´s the way we like it. Jörgen Falmer (keyboards) writes most of them. Since the start in 1990, Kiethevez have played quite a lot live. No tours and nothing abroad, but almost everywhere in Sweden. It was harder to get live gigs before the "Replenish My Mind" single, which by the way has sold quite well. The first pressing is sold out and the second pressing was released at the same time as the "Three Empty Words" album. However, new complications have emerged. About a month ago, Jörgen started his time in the army. So now they´ll have to try to manage without him. - If we can do the live gigs on the weekends perhaps he can attend as well, says Per-Henrik. We´ve been working on a project for a year now, he says. It´s a video for "Anything Higher" that´s been edited by the same man who´s done a video for Ace Of Base. So we´ve really got some expert help, Per-Henrik laughs. It´s important the video is good. MTV are very selective. Kiethevez have also made a live video which includes "Anything Higher". About a month after the album they´ll release a new single, "Nothing I can Do/Anything Higher". The single also includes the recurrent theme of the film "Violent Relations". It got awards for best script and second best soundtrack at a Swedish film festival in 1993. 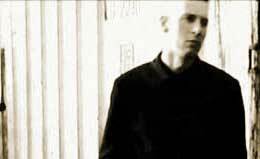 EBM (Electronic Body Music) is on the way out. The harder bands of the genre are starting to go Ministry while the melodious ones go synthiepop. -Pop music today is very electronic. That has made it easier for people to listen to synthiepop and therefore the genre is growing. The synthiepop label October contacted Kiethevez and this resulted in their participation on the "Sounds Of October" compilation with three songs. Dennis Berggren from October liked the songs and since then they´ve cooperated. - We were offered to contribute one song for a Memento Materia compilation, but we went with three songs on October. The recording of "Three Empty Words" was made at Studioljudet outside Gothenburg and they are really happy with the result. - We wanted to try something different for one of the songs, so on the last track Jonas Franke-Blom played the cello. We got the real feeling and the right sound. My favorite song on the album is "With The Frights Inside". Perhaps it´s not a hit song, but the lyrics are very memorable. Anyhow, "Three Empty Words" is a brilliant piece of work. Probably the synthiepop album of the year.